Now let's be honest, who actually turns down the G&T for tea? Anyway, I had always drunk Gordon's, which is fine but it's nothing special, especially after my sister got me climbing up the shelves to the likes of Hendrick's! Now when I go out if I'm undecided on what I want, my go to drink is a G&T, unless it's a cocktail bar and then the world is my oyster! 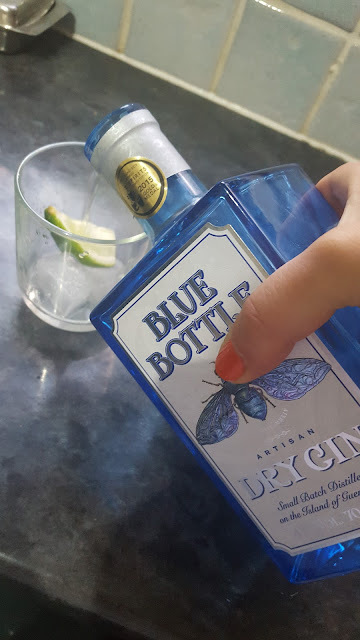 Anyway, my sister introduced me to Blue Bottle Gin from Guernsey, it's a small batch distillery and only really available to buy on the island and man is it good! Instead of a champagne reception at my sister's wedding they had a gin and tonic reception with this stuff, and the bar sold out! I couldn't resist picking myself up a bottle at the airport and now I'm hooked! It's turned into a full blown love affair, I'm dreading the day the bottle runs out, and I'm planning a day trip to Guernsey when we visit my dad in Jersey mostly so that I can stock up! It's a fabulous excuse for a weekend getaway. I guess on the plus side when it's empty I am left with a lovely empty bottle for candles or flowers... Right?!?! I think the safest bet will be to get another bottle in before that day comes just in case... All other gin has now been ruined for me. Mine is Hendricks with cucumber. A classic. Other than that it's hard to beat a well-made mojito. The chances of getting a well-made mojito in a bar are very slim.